There is compelling evidence that genetic factors play an important role in prostate cancer, but no unequivocally disease causing mutations in prostate cancer susceptibility genes have been identified. In 2002, Carpten et al1 reported that variants in the gene RNASEL were present in some multiple case prostate cancer families. RNASEL maps to the region of chromosome 1q that has been linked to prostate cancer in multiple case prostate cancer families2 and this locus is often referred to as HPC1. In particular, a truncating variant, E265X, was identified in a single kindred with several cases of prostate cancer and functional analysis and the presence of loss of heterozygosity at markers close to RNASEL in one tumour supported a putative pathogenic role for this variant. However, subsequent publications have questioned the biological significance of truncating and missense variants in this gene3 ,4 and its true importance in determining prostate cancer risk remains uncertain. Rennert et al5 recently identified a variant in RNASEL, known as 471delAAAG, in an Ashkenazi Jewish (AJ) man who was diagnosed with prostate cancer at the age of 65. 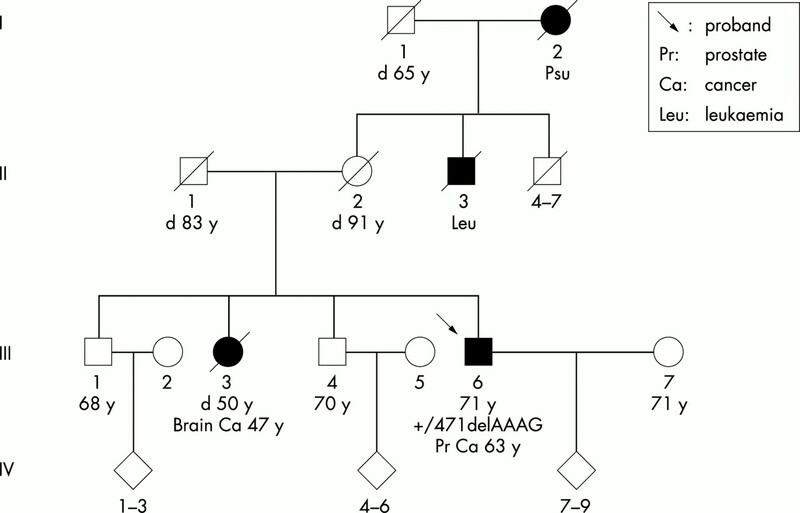 Notably, his brother was also affected with prostate cancer at the age of 57 and was found to be homozygous for this variant. The authors then looked for this variant in 119 Israeli men with prostate cancer, among whom 87 were of AJ origin. They identified six men who carried this variant, all among the AJ males (6.9%, 95% confidence interval (CI) 2.6 to 14.4). Lower frequencies were found among elderly AJ without prostate cancer (2/83, 2.4%, 95% CI 0.29 to 8.4) and among young AJ females (6/150, 4.0%, 95% CI 1.5 to 8.5). No variants were identified in non-AJ subjects with or without prostate cancer. Limited haplotype studies indicate that the variant identified is a founder within the AJ population. Using hospital based tumour registries, we have identified 437 self-reported AJ men with prevalent prostate cancer, diagnosed between 1991 and 2002, who were known to be alive in 2002. All men were diagnosed and/or treated in one of three large McGill University affiliated hospitals in metropolitan Montreal, Canada. Most Montreal AJ men with prostate cancer are treated by physicians affiliated with one of these hospitals. The diagnosis of invasive prostate carcinoma was confirmed by examining the pathology reports present in the medical charts of all the eligible participants. At the time of writing, 227 have been contacted and 210 remain to be contacted (reasons for lack of contact: physician approval pending, returned unopened letters, address unknown, left town). Of the 227 contacted, 157 have responded to our letter. Of 157 affected males who were eligible to take part and have been contacted as of September 2002, 122 agreed to participate in the study and were genotyped for the RNASEL variant. Thirty-five affected males chose not to participate in this study. None of these men cited ill health as the reason for their refusal. Thirteen probands had one first degree relative with prostate cancer (10.7%) and two had more than one first degree relative with prostate cancer (1.6%). The median age at diagnosis of participants was 67.2 years (range 48.6-85.7 years) and the participants were tested at a median of five years since diagnosis (range 0.3-11.5 years). Of the 122 participants, 34 (27.9%) were found to have a Gleason score of 5/10 or lower (median number of months since diagnosis = 80) and 58 (47.5%) had a Gleason score of 6/10 or greater (median number of months since diagnosis = 63). This difference in the time interval between diagnosis and blood drawing, dichotomising at a Gleason score of 6, is statistically significant (p=0.046, Mann-Whitney U test). However, when we regressed the Gleason score against the time interval in months between the date of diagnosis and the blood draw there was less evidence for an effect across all scores. The correlation coefficient (r) was –0.106 (r2 = 0.01, p=0.32). Thus we have some evidence that our sample is, perhaps not surprisingly, slightly biased towards longer surviving affected men with lower Gleason scores. We do not have the final Gleason score for 29 men (23.8%, median number of months since diagnosis = 72). After informed consent, a pedigree was drawn for all consenting subjects and a blood sample was taken for DNA extraction and genetic studies. Of the 122 cases, eight were subsequently removed from the final analysis because of insufficient DNA to complete testing. The gene RNASEL has been implicated in prostate cancer. A mutation, referred to as 471delAAAG, was identified in RNASEL in an Ashkenazi Jewish (AJ) male with a family history of prostate cancer. Subsequently, it was found in 6/87 unselected AJ men with prostate cancer and in 2/83 elderly AJ men without prostate cancer (odds ratio 3.0, p=0.28). We tested 111 AJ probands affected with prostate cancer for the 471delAAAG mutation; only one carrier was identified. In 105 AJ controls, two carriers were identified (odds ratio 0.47, p=0.61). The results do not suggest that this variant is associated with a greatly increased risk of prostate cancer, which might be expected to occur if RNASEL is a candidate prostate cancer susceptibility gene within the linked HPC1 region. These observations are preliminary. Very large sample sizes are required to exclude small relative risks when the allele frequency is low. This is a significant impediment to robust replication studies. We used the previously published primer sequences to amplify the relevant fragments from RNASEL.5 PCR was performed using 100 ng of genomic DNA in the presence of 300 μmol/l of each dNTP, 20 pmol of each primer, 1 × QIAGEN standard PCR buffer (includes 1.5 mmol/l MgCl2), and 5 U of HotStar Taq DNA polymerase (QIAGEN Inc, Mississauga, Ontario, Canada). A forward primer labelled with CY5.5 was used. After an initial denaturing step of 15 minutes at 95°C, amplification was performed over 35 cycles in a Perkin Elmer 9600 thermocycler at 94°C for 30 seconds, 60°C for 30 seconds, and 72°C for 30 seconds. PCR products were mixed with formamide loading dye and separated on 5% acrylamide denaturing gels for 3½12 hours at 70 W. Fragments were visualised using the STORM 860 phosphorimager (Molecular Dynamics, Amersham Biosciences, Sunnyvale, CA). The variant was visible as a band shift below the normal product on the gel. We included a PCR product of DNA from LNCaP on all screening runs, as this cell line has also been shown to carry this variant.5 The presence and copy number of the variant was confirmed in all carriers by direct sequencing. DNA samples were sequenced using the Visible Genetics OpenGene© system (Visible Genetics, Toronto, Ontario, Canada) and the Cy5.5 Dye terminator cycle sequencing kit (Amersham Pharmacia Biotech, Piscataway, NJ, USA). Data acquisition and base calling was achieved with the Gene ObjectsTM software (Visible Genetics). Since eight samples did not amplify the 471 delAAAG region, we were left with a total of 114 cases. This total includes two sets of brothers (two in one family and three in the other) who were independently recruited into the study. Thus, we have 114 subjects from 111 different families included in the final analysis. We identified a single 471delAAAG carrier among the 111 probands (0.90%, 95% CI 0.02 to 4.9, table 1 ). Among 105 anonymised but unaffected AJ controls, we found two carriers of this variant (1.9%, 95% CI 0.2 to 6.7%, table 1 ). This difference is not statistically significant (OR 0.47, p=0.61, table 1 ). The variants seen were confirmed by direct sequencing, including LNCaP as a positive control (data not shown). The single affected carrier was diagnosed with a Gleason grade 9 prostate cancer in 1994. He was treated by hormonal therapy followed by prostatectomy and is clinically free of disease. His blood was drawn for this study in 2001. His sister was diagnosed with brain cancer at the age of 47, but there are no reported cases of prostate cancer in his family (fig 1 ). Pedigree of carrier of RNASEL 471delAAAG. We confirmed that 471delAAAG is likely a founder variant by examining the genotypes of all three carriers at five variable loci surrounding the RNASEL region (D1S2883, D1S2619, D1S2623, D1S2127, and D1S240; see the Genome Database Website, www.gdb.org, for details regarding PCR amplification conditions). All carriers shared a common allele for each locus, while LNCaP was observed to diverge at two loci, D1S2619 and D1S240, located 168 kb downstream and 2.5 Mb upstream of RNASEL, respectively (marker positions according to the June 2002 freeze of the Human Genome Browser on GoldenPath). A graphic representation of the region is provided in fig 2 . 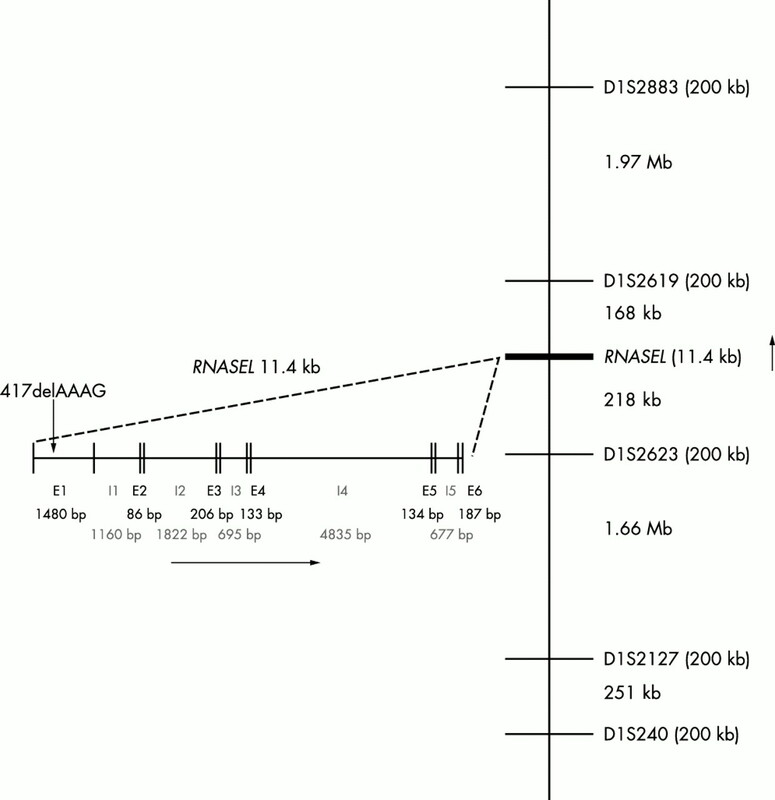 Chromosome 1q region surrounding RNASEL. It is clear that in our study, as in the original report, there is no significant difference in the frequency of the RNASEL 471delAAAG allele in those with or without prostate cancer. We compared the allele frequencies in the two series of cases and controls. Although the allele frequencies in the two groups of controls do not differ (8/233 (Israel) v 2/105 (Montreal), p=0.44, two sided), when comparing the cases there were significantly fewer 471delAAAG carriers in Montreal (1/111) than in Israel (6/87) (p=0.02, two sided). It is important to recognise that given the low prevalence of the founder variant (∼3%), when combined, these sample sizes provide an 80% power to detect significant odds ratios of approximately 4.0 or greater, so smaller effects cannot be excluded at this stage. Very large sample sizes of more than 2500 cases and 2500 controls would be needed to exclude an effect of 1.5-fold or less. The genetics of prostate cancer is complex and no single highly penetrant gene has been identified.6 In the AJ population, founder mutations have been identified in several genes that are responsible for autosomal dominantly inherited cancer susceptibility syndromes,7 but up until now, no founder mutation has been found to predispose specifically to prostate cancer. Our results suggest that although the 471delAAAG variant is present in the AJ population, because of its low frequency among affected men, it does not appear to be an important contributor to prostate cancer risk in this population. It is important to note that as the men in our study are prevalent cases of prostate cancer, it is possible that the variant could particularly predispose to aggressive prostate cancer and we have under-ascertained these men. We also note that, like the previous report,5 this is not a population based study and therefore the results cannot necessarily be extended to all AJ men with prostate cancer who live in Montreal. One population based study points towards an as yet unidentified autosomal dominant, moderately penetrant prostate cancer susceptibility allele that has a high population frequency.8 On the current evidence, including that presented here, RNASEL does not appear to be such an allele.1,3–5 As such, it would be premature to consider offering RNASEL genetic testing for prostate cancer risk on the basis of the current data. This work was funded by the US Department of Defence, grant number DAMD17-00-1-0033, and the Canadian Genetic Diseases Network. We thank all the men who participated in this study. We also thank McGill University urologists (A Aprikian, S Aronson, J Corcos, M Elhilali, Y Taguchi, S Tanguay) for their help in recruiting cases and George Chong, Fiona Young, and Nora Wong for assistance. Smith JR, Freije D, Carpten JD, Gronberg H, Xu J, Isaacs SD, Brownstein MJ, Bova GS, Guo H, Bujnovszky P, Nusskern DR, Damber JE, Bergh A, Emanuelsson M, Kallioniemi OP, Walker-Daniels J, Bailey-Wilson JE, Beaty TH, Meyers DA, Walsh PC, Collins FS, Trent JM, Isaacs WB. Major susceptibility locus for prostate cancer on chromosome 1 suggested by a genome-wide search. Science1996;274:1371–4. Rökman A, Ikonen T, Seppala EH, Nupponen N, Autio V, Mononen N, Bailey-Wilson J, Trent J, Carpten J, Matikainen MP, Koivisto PA, Tammela TL, Kallioniemi OP, Schleutker J. Germline alterations of the RNASEL gene, a candidate HPC1 gene at 1q25, in patients and families with prostate cancer. Am J Hum Genet2002;70:1299–304. Ostrander EA, Stanford JL. Genetics of prostate cancer: too many loci, too few genes. Am J Hum Genet2000;67:1367–75. Ostrer H. A genetic profile of contemporary Jewish populations. Nat Rev Genet2001;2:891–8. Gronberg H, Damber L, Damber JE, Iselius L. Segregation analysis of prostate cancer in Sweden: support for dominant inheritance. Am J Epidemiol1997;146:552–7.